To Cite: Shojaie B, Ferdosi M, Keyvanara M, Yarmohamadian M H. The Overt and Covert Effects of Iranian Health Transformation Plan on Medicine and Medical Supplies, Health Scope. 2018 ; 7(S):e68047. doi: 10.5812/jhealthscope.68047. Background and Objective: Recently in Iran, the Health Transformation Plan (HTP) was formulated by policy makers to reduce the amount of the out of pocket expenditures. The HTP caused different effects on medicines and medical supplies. The purpose of this paper was the identification of these effects. Methods: This study was a qualitative research performed in a 14-month interval in Iran during 2014 - 2015. A total of 17 semi-structured interviews were used for data gathering. Participants were health authorities associated with the subject of the research and background in health executive management. They were aware of the HTP. Purposive sampling was done for data saturation. Criteria such as “Credibility”, “Conformability”, and “Dependability” were considered. Interviewees’ anonymity was preserved. The data were transcribed, categorized, and then used the thematic analysis. Conclusions: The HTP, besides positive and overt effects, had covert effects. The HTP increased not only in patients’ inclination to stay more in hospitals, but also it increased total health expenditures and wasting resources. It could be suggested that, policy makers use this results to guarantee the success of the HTP. Health sector reform or health system transformation is a general term used for discussing major health policy, creation or changes for the most part, and governmental policy that affects health care delivery in a given place. The health sector reform attempts to improve access to the health care and quality of them and decrease costs of the health care (1). According to one advanced definition from the Data for Decision Making (DDM) “the reform implies sustained, purposeful, and fundamental changes in the health sector” (2). Historical overview of trends of the health system reforms in all over the world shows 3 waves of the reforms. The first wave ensured access to the health services and the universal coverage. Rising costs led to the 2nd wave of the reforms. This period focused on limiting expenses. The 3rd wave of the reforms that is implementing in most developed countries is related to the efficiency and quality of the health systems and safety of patients (3). In Iran, implementation of the health system transformations such as the Primary Health Care (PHC) - in format of the Public Health Network- the universal health insurance scheme and the family physician represent that they are in line with the first wave (4). However, the Demographic and Health Survey (DHS) index measured by the National Institute of Health Research (2010) showed that 17% of the Iranian households were not covered by any health insurance (5). The Eastern Mediterranean Regional Office (EMRO) of the WHO reported (2011) that in Iran, the share of the out of pocket (OOP) payments was 58% of the total health expenditures (6). It is noticeable that more than 45% of the total costs of medicines were paid by patients through the OOP (7). Thus, in Iran, the increase in the OOP payments resulted in a rise in the Catastrophic Health care Expenditures (CHE) (8, 9). Several regional studies reported that in Iran, a range of 8.3% to 22.2% of households were faced to the CHE (10-13). These evidences went against objectives of the 5th Economic, Social, and Cultural Development Plan. The objectives included decreasing the share of the OOP payments in the total health expenditures by 30% and reducing incidence of the CHE to less than 1% (14). Therefore, one of the main challenges of health care policy makers was to improve the situation. In order to, the Health Transformation Plan (HTP) was formulated and promulgated by the policy makers of the health system. The HTP started on May 5, 2014 and consisted of 8 executive packages. The first package involved reducing the OOP paid by patients qualified for basic health insurance. Urban inpatients just paid 6% of the total hospitalization expenditures and these expenditures were 3% for rural inpatients in public hospitals. Under this reform, all individuals without the basic health insurance could be covered free of charge. The public hospitals were required to provide all diagnostic and therapeutic services, medicines and medical supplies for all inpatients in the hospital or in the supply chain (15). Like other reforms in the field of health, implementation of the HTP resulted in series of changes in the health sector. Medicines and medical supplies are key factors in implementing the HTP. Therefore, this research intended to identify the effects of the HTP on the medicines and medical supplies. This study was performed in a 14-month interval during 2014 - 2015. A qualitative research method, with semi-structured interview, was used. Participants in this survey were health authorities associated with the subject of the research and background in health executive management. They were also aware of the HTP. The purposive sampling method was used in this study. In other words, people were interviewed that were well-informed and had valuable experiences in this field as well as were willing to participate in the research. In addition, an interview guide was used. This guide included introducing interviewer and research subject, then asking main, additional, and clarifying questions about determined topics. The questions were open-ended. Interviews were conducted by maintaining the neutrality of researchers. In order to have moral considerations, interviewees’ consent was gained. The participants were also informed that interviews would be recorded to easy transcribing. They were assured that their name and others information would be confidential. The interviews continued till themes emerged and saturation was achieved. Accordingly, 17 in-person interviews were conducted. Duration of the interviews ranged from 50 to 80 minutes. All interviews were recorded and after each interview, they were transcribed. Data analysis in this research was based on thematic analysis. The data analysis were concluded immersion in the data, encoding, recording reflective signs, recording marginal signs, abstracting, and developing of recommendations. In this way, each of the interviews was divided to sub-themes and then the sub-themes were merged and reductionism was done and ultimately, the main themes were identified. Essential quality criteria such as Credibility, which is the results of qualitative research, are believable from perspectives of the participants in the research, Dependability, which is the reliability of the study, and Confirmability, which is the result that could be confirmed or corroborated by each researcher were considered. For the credibility of the research, several interviews were conducted under supervision of the experts. For the dependability of the process of the research, the first interview was considered by supervisors and for the dependability of the products, the obtained data referred to some of the participants and their views were considered. In this research, a thematic analysis method was used, in which 2 major categories were obtained. The 2 major categories included the overt and covert effects of the HTP. The overt effects category consisted of 23 sub-themes and 3 themes. The covert effects category consisted of 3 themes (Figure 1). The participants mentioned the overt effects of the HTP in 3 themes including (I) optimizing the management of medicine and medical supplies, (II) cost controlling medicine and medical supplies, and (III) improving the supervision on distribution and consumption of them. Each theme had several sub-themes. Furthermore, activation of medicine and medical supplies committees, organizing the distribution network of medical supplies, and rising distributors' knowledge level were other overt effects. Revision of pharmacopeia, provision of pharmaceutical formulary, and provision of pharmaceutical protocols were the overt effects of the HTP that affected medicine management positively. In addition, the participants believed that foreign exchange saving, pricing, and registration of the medical supplies in official web site of MOHME were other overt effects. The participants expressed that supervision on the amount of medicine consumption, supervision on medicine prescription according to hospital pharmacopoeia, reduction of using several times of medical supplies, establishment of the Medicine, and Medical Supplies Technical Committee of the HTP were the overt effects that led to improve the supervision on consumption. Moreover, establishment of the Supervision Unit, issuance of IDs for all distributers of medicine and of medical supplies were the overt effects that improved the supervision on distribution. The participants referred to 3s themes including an increase in demand for hospitalization, a rise in total costs, and waste of the hospital resources. The research was conducted for replying to the following questions. What are the effects of the HTP on medicines and medical supplies? How does the HTP affect medicines and the medical supplies? In replying to these questions, 2 categories of effects were identified. 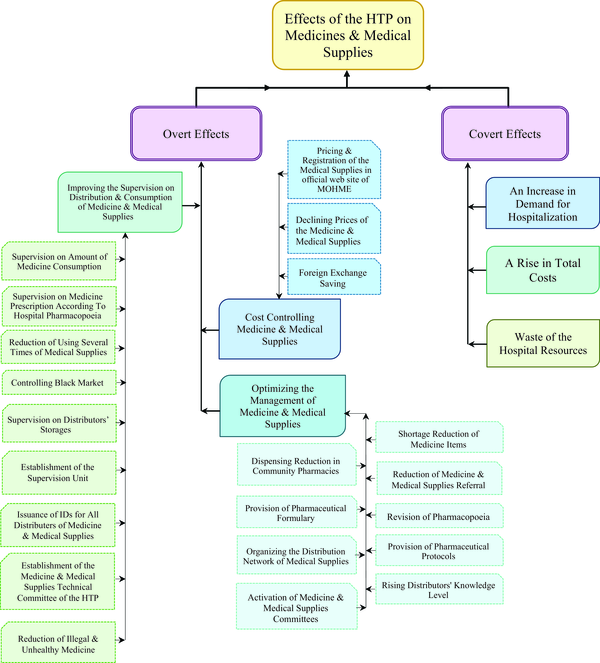 (I) The overt effects included optimizing the management of medicine and medical supplies, their cost controlling, and improving of supervision on distribution and consumption of them. (II) The covert effects included an increase in demand for hospitalization, a rise in total costs, and waste of the hospital resources. The activation of the Medicine and Medical Committee in public hospitals caused to reduce the shortage of the medicines considerably in the hospitals. Therefore, the amount of referral pharmacy to out of hospitals decreased. A recent study in Iran showed that after execution of the HTP, just 11.5% of inpatients had to provide medicines and medical supplies themselves from out of the hospital (16). In addition, the Medicine and Medical Supplies Technical Committee was established in the Deputy of Treatment. The committee supervised consumptions of the medicines and medical supplies in public hospitals. A report on Chamran Hospital in Esfahan showed that consumptions of medical supplies were effective in comparison with before beginning the HTP (17). Increasing admissions and decreasing pharmaceutical referral led to a raise in total costs of medicines and medical supplies significantly. Recent studies in Iran showed that the medicines and medical supplies items increased considerably in the hospital and the monetary equalled 87.2% growth, which affected hospital costs increasingly (18). A recent study showed that 77% of the HTP’s budget was allocated to medicines and medical supplies in Al Zahra hospital in Esfahan (19). Another study also showed that after the reform, 63% of credits were spent for medicines and medical supplies in public hospitals in Esfahan (20). Reduction of price of medicines and medical supplies items caused that many low-income people rushed to public hospitals for receiving medicines and medical supplies under hospitalization services. Other studies showed that the HTP caused to increase demand for hospitalization unexpectedly in Iran (21-23). In addition, this situation has been reported in other developing countries. For example in China, by executing the Zero-Market Drug Policy (the reform related to reduction of costs of medicine and to make essential medicines affordable to low-income individuals), the amount of hospitalization became double (24). However, in developed countries such as the United State of America, after implementing the Affordable Care Act (ACA), the amount of demand for hospitalization were reduced (25). The increase in demand for hospitalization imposed extra costs. In addition, limited resources of the hospitals were used for unnecessary admission. Another resent study in Iran showed that the HTP led to the extra consumptions of the resources by public hospitals (26). In contrast, in Massachusetts (USA), no increase in costs was observed after the health reform (27). This study is a qualitative research. Although the HTP was a macro reform with determined single mandatory for Iran, it was possible that there was a difference in proceeding in various areas. Our study was performed in Esfahan, the big province located at the centre of Iran, therefore, this might not be extensible to all over Iran. Additionally, according to the objectives of the study, we used the viewpoints of executive managers and decision makers in the level of the province. It is suggested that, the future studies will be conducted based on view points of the other stakeholders such as policy makers, patients and so on. According to participants’ viewpoints, the HTP had the overt effects that appeared immediately after the reform and they were in line with the goals of the HTP. Besides positive and overt effects, the HTP had covert effects. The covert effects were emerged after the overt effects. In addition, there were unsought and unexpected effects that even conflicted with the goals of the reform. The HTP increased not only patients’ inclination to in the hospitals longer, but it also increased the total costs of hospitals and wasting resources. Therefore, it was necessary that the covert effects were identified to policy makers, so they can remove them and ensure they are achieving the HTP’s goal. We would like to express our gratitude to Isfahan University of Medical Science for financial support and also the faculty of Medical Management and Information Sciences for their cooperation. We would also like to thank the participants for their interviews. We are grateful to the public hospitals in Isfahan province. 1. Cassels A. Health sector reform: key issues in less developed countries. J Int Dev. 1995;7(3):329-47. [PubMed: 12290761]. 2. Berman P. Health sector reform: making health development sustainable. Health Policy. 1995;32(1-3). 3. Cutler DM. The Third Wave in Health Care Reform. In Ogura , Tachibanaki , Wise DA, editors. Aging Issues in the United States and Japa. Chicago: University of Chicago Pres; 2001. p. 169-86. 4. Jabbari A, Shojaie B, Kabiri S, Foroughi Z. Trends of health system reforms in developed countries: Lessons for the Iranian health system. In International Conference on Sustainable Reform in Health System. Esfahan; 2015. 154 p.
5. Rashidian A, Karimi-Shahanjarini A, Khosravi A, Elahi E, Beheshtian M, Shakibazadeh E. Iran's Multiple Indicator Demographic and Health Survey-2010: Study Protocol. Int J Prev Med. 2014;5(5). 6. World Health Organization . The Work of WHO in the Eastern Mediterranean Region. Geneva: World Health Organization, EMRO; 2011. 7. Andayesh Y, Keshavarz K, Zahiri M, Mirian I, Beheshti A, Imani A. The Effects of Drug Subsidies Exclusion on Price Index of Sectors and Household`s Expenditures; Using Structural Path Analysis. J Health Administ. 2011;13(42):45-56. 8. Challenges and prospects for the fourth socio-economic development of the country's health system. Act. Theran: Minstry of Health and Medical Education of Iran, Reaserch and development;; 2005.Minstry of Health and Medical Education of Iran. 9. Ahmadi AM, Mohammadzadehi Y, Sadeghi H, Hasanzadeh A. Measuring Health Inequalities and its Importance in Total Inequities in Iran. J Basic Appl Sci Res. 2013;3(9):392-400. 10. Kavosi Z, Rashidian A, Pourreza A, Majdzadeh R, Pourmalek F, Hosseinpour AR, et al. Inequality in household catastrophic health care expenditure in a low-income society of Iran. Health Policy Plan. 2012;27(7):613-23. doi: 10.1093/heapol/czs001. [PubMed: 22279081]. 11. Amery H, Jafari A, Panahi M. Determining the rate of Catastrophic Health Expenditure and its influential factors on families in Yazd Province. J Health Administ. 2013;16(52). 12. Kavosi Z, Keshtkaran A, Hayati R, Ravangard R, Khammarnia M. Household financial contribution to the health System in Shiraz, Iran in 2012. Int J Health Policy Manag. 2014;3(5):243-9. doi: 10.15171/ijhpm.2014.87. [PubMed: 25337598]. 13. Karami M, Najafi F, Karami Matin B. Catastrophic health expenditures in Kermanshah, west of Iran: magnitude and distribution. J Res Health Sci. 2009;9(2):36-40. 14. Five-Year Economic, Social and Cultural Development Plan of the Islamic Republic of Iran. Act. Tehran: Planning and Management Organization of the Islamic Republic of Iran; 2010-2015.Planning and Management Organization of the Islamic Republic of Iran. 15. Health Transformation Plan [Act(Health Transformation Plan)]. Tehran; 2014.Ministry of Health and Medical Education. 16. Khayeri F, Goodarzi L, Meshkini K. Evaluation of the National Health Care Reform Program from the Perspective of Experts. Client Center Nurs Care. 2015;1(1):37-46. 17. Karimi S, Mohammadzade MJ, Madagian B. comparision of effective factors on wasting medical suply in Chamran hospital before and after of Health Transformation Plan. In International Conference on Sustainable Reform in Health System. Esfahan: Medical University of Isfahan press; 2015. 119 p.
18. Shetabi HR, Karami MB, Joybari T, Naseri H. SURVEY of Health evolution system effect and influence on drugs and consumption material requests in imam reza hospital of kermanshah. In International Conference on Sustainable Reform in Health System. Esfahan: Medical University of Isfahan press; 2015. 116 p.
19. Jahangard MA, Roshanian E, Falahzade M, Ganji H, Rahimi M. Study of the health subsidy contributed to the medicine in Al-Zahra Medical Center. In International Conference on Sustainable Reform in Health System. Esfahan: Medical University of Isfahan press; 2015. 48 p.
20. Hatam Por F, Jafarian F. Spending credits of reduced payment inpatients paln in educational hospitals in Esfahan. In International Conference on Sustainable Reform in Health System. Esfahan: Medical University of Isfahan Press; 2015. 78 p.
21. Golmakani A, Mortazavi H, Mohades Hakak H, Eftekhari Nasab J. The opinions of Health Transformation plan's stakeholders. In National conference in critic of performance of goverment11th. Tehran: National Institute of Health Research of Iran press; 2015.Rahim Zadeh. p. 54-5. 22. Behzadifar M, Behzadifar M, Behzadifar M, Saki K, Keshavarzi A. Point of view of health administrators and health mastrs about challenges of Health Transformation Plan: Qualitative research. In International Conference on Sustainable Reform in Health System. Esfahan: Medical University of Isfahan press; 2015. 9 p.
23. Ashrafi A, Shansian E, Namazi M, Kazemi R, Nateghi D. Satisfication and the transformation of the health system executives points of views Chamran hospital. In International Conference on Sustainable Reform in Health System. Esfahan: Medical University of Isfahan press; 2015. 79 p.
24. Yi H, Miller G, Zhang L, Li S, Rozelle S. Intended and unintended consequences of China's zero markup drug policy. Health Aff (Millwood). 2015;34(8):1391-8. doi: 10.1377/hlthaff.2014.1114. [PubMed: 26240254]. 25. Pourat N, Davis AC, Chen X, Vrungos S, Kominski GF. In California, Primary Care Continuity Was Associated With Reduced Emergency Department Use And Fewer Hospitalizations. Health Aff (Millwood). 2015;34(7):1113-20. doi: 10.1377/hlthaff.2014.1165. [PubMed: 26153305]. 26. Alidadi A , Zaboli R, Hosseini S, Chaghari M, Moini Matin H. The main chalenges and oportiunities of reduced payment of inpatient plan in health map. In National conference in critic of performance of goverment11th. Tehran: National Institute of Health Research of Iran; 2015. p. 81-2. 27. Kolstad JT, Kowalski AE. The Impact of Health Care Reform on Hospital and Preventive Care: Evidence from Massachusetts(). J Public Econ. 2012;96(11-12):909-29. doi: 10.1016/j.jpubeco.2012.07.003. [PubMed: 23180894].